Tesla CEOElon Musk once suggested the $US35,000 base priced version of the Model 3 sedan would arrive by the end of this year, but customers won’t be able to take delivery of it before February 2019, according to Tesla’s website. On the Model 3 order page, the automaker says versions of the vehicle with a standard battery – which Tesla says will have a 220-mile range – will become available in four to six months. Currently, the least expensive version of the Model 3 starts at $US45,000 and has a mid-range battery that Tesla says offers an Environmental Protection Agency-estimated 260-mile range. TeslaCEO Elon Musk once suggested the $US35,000 base priced version of the Model 3 sedan would arrive by the end of this year, but customers won’t be able to take delivery of it before February 2019, according to Tesla’s website. On the Model 3 order page, the automaker says versions of the vehicle with a standard battery – which Tesla says will have a 220-mile range – will become available in four to six months. Currently, the least expensive version of the Model 3 starts at $US45,000 and has a mid-range battery that Tesla says offers an Environmental Protection Agency-estimated 260-mile range. In May, Musk said on Twitter that Tesla would need three to six months after hitting a production rate of 5,000 Model 3s in one week before shipping the $US35,000 version. Tesla hit that production goal at the end of June. A Tesla representative said Model 3 sales and production are increasing at a rapid pace and declined to comment on the disparity between Musk’s timeline and the timeline listed on the Tesla website. The Model 3 was designed to broaden Tesla’s customer base beyond the luxury segment and has generated significant demand since Tesla began taking reservations for it in March 2016. 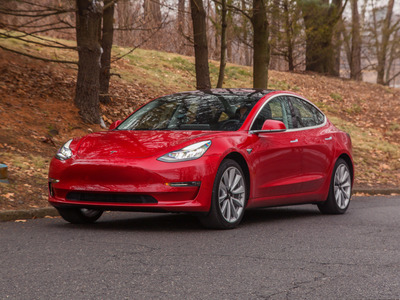 The car has been praised by reviewers, including Business Insider’s Matthew DeBord, who said a version priced at $US57,500 was “among the small cadre of vehicles I’ve driven in my life that I have felt fit me absolutely perfectly and satisfied my every desire.” But the Model 3 has also been subject to reports of inconsistent quality and production delays. With production, 1st you need achieve target rate & then smooth out flow to achieve target cost. Shipping min cost Model 3 right away wd cause Tesla to lose money & die. Need 3 to 6 months after 5k/wk to ship $35k Tesla & live. Tesla initially struggled to hit its production targets for the vehicle due in part to excessive automation at its Fremont, California, factory. In May 2016, Musk estimated the company would make 100,000 to 200,000 Model 3s during the second half of 2017, though Tesla made just 2,685 Model 3 vehicles in 2017. At the end of June, Tesla hit its long-delayed goal of making 5,000 Model 3 vehicles in one week and, at the beginning of this month, the automaker reported that it exceeded Wall Street expectations by delivering 55,840 Model 3 vehicles during the third quarter.